The MyNORCAL CME app for iOS and Android provides fast, simple and convenient access to CME credit. Read articles and watch on-demand webcasts, take interactive quizzes and receive CME credit and certificates while on the go. Now you can read the CME materials, or watch on-demand webcasts, take the quizzes, and print/email your CME certificates right from the app. 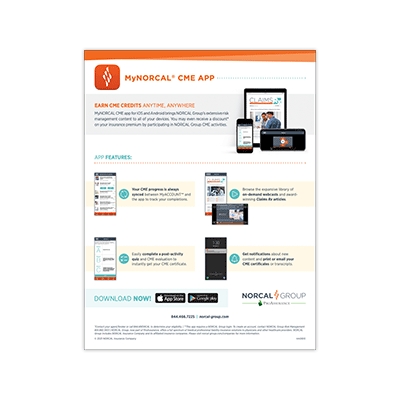 The free MyNORCAL CME app has all the same CME materials available in MyACCOUNT, automatically syncing your CME activity with your other devices. Select from an expansive library of exclusive CME activities on timely and relevant topics that can help reduce risk for you and your practice. Take a short quiz based on what you’ve learned using a unique and intuitive interface designed specifically for CME activities. Get notifications of the newest CME activities, review completed activities and print or email your CME certificates or transcripts. * This app requires a MyACCOUNT login from a NORCAL Group company. Policyholders can contact NORCAL Group Customer Service at 844.4NORCAL.